If stress burned calories, many of us would weigh 90 pounds, right? Work, family, and the never ending “to do” list all create significant stress in our lives. 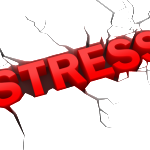 Most of us adults can effectively manage our stress. But what about children, especially kids whose parents are going through a divorce? Understandably, divorce causes a great deal of stress for children. They are full of fear over the changes they are experiencing, and often worry they are the reason their parents are getting divorced. One of my main goals when working with clients is helping them help their kids manage stress during and after divorce. Children generally respond to stress in one of the following three ways (developingchild.harvard.edu). Positive stress response is a healthy part of development where kids learn to cope. Children experience positive stress when getting a shot or starting school after summer vacation. Tolerable stress is more serious and longer lasting, but manageable. This is often the type of stress children experience when their parents get divorced. The good news is both of these types of stress can be negated by positive, loving relationships with parents and other caregivers who can help them adapt and cope with stress. However, if parents are so high-conflict they are not able to develop a cooperative co-parenting or parallel-parenting relationship, kids are at risk for developing a toxic stress response. Toxic stress puts children in a constant state of fight-or-flight mode, affecting their brain development, suppressing their immune system and causing learning and memory problems. As adults, children who experience toxic stress are at risk of developing heart disease, substance abuse problems and depression. Obviously we want to help kids manage stress so that it doesn’t become toxic. Understanding it’s normal for kids to be stressed during the divorce process. Don’t get stressed because the kids are stressed! Validating the kids’ feelings about the divorce. “I know you feel sad,” or, “I understand you miss seeing your mom everyday like you used to.” Kids need to hear it’s okay to feel how they feel. Encouraging honesty. The kids may feel guilty about having fun with dad and his new girlfriend. While hearing this may be hurtful for mom, it’s important kids know they can always be honest with both parents. Asking the kids what they think would make them feel better. Sometimes the only answer may be that mom and dad get back together, and that’s okay. Try to offer simple ideas like taking a walk, watching a movie together, or calling the other parent. Keeping a regular routine, especially for younger children. Routine and consistency give kids tremendous security and comfort. Repeatedly reassuring them they are not the cause of the divorce and that both parents will always love them, no matter what. Divorce is often referred to as “crazy time” with good reason. The stress created by the huge number of changes divorce brings is difficult for adults and children alike. However, parents can help their kids cope with the stress effectively so they can positively adjust to their new life. Erin Kassebaum provides mediation, coaching and parenting consulting services on a sliding fee scale. She is located in Bloomington. Please feel free to contact Erin with any comments or questions at 612.599.8366 or erin@resolutiondivorceservices.com. “Like” her on Facebook: https://www.facebook.com/erinkassebaumrds.